In this tutorial we will create an options menu. The options menu is the menu that pops up (usually below) in an application whenever the user presses the Android options key on the phone. The menu, pictured above, will consists of two options each with an icon and descriptive text. The selection of anyone of the options will trigger an event, in this case a toast message, pictured below. 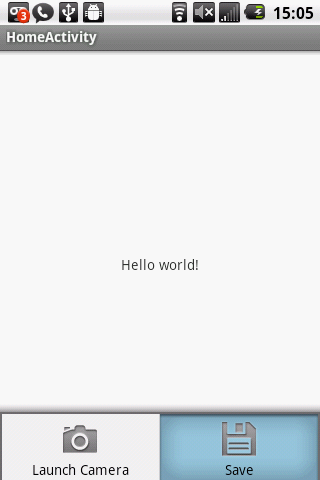 Note: If you are using the latest version of the Android ADK Eclipse will automatically add a menu layout xml file for each activity you create, the name will be the same as the activity’s layout file. The contents of our menu XML file consist of a <menu> tag with an <item> tag for each option I want my menu to have. The Item tag requires an id and title to identify the option by code and visually respectively, an icon may also be added. Many icons are available withing android, that’s what we are using, you may also supply your own icons. You can see what other menu icons are available by using the Eclipse’s auto-complete function after typing “@android:drawable/”. In the activity Java file, to attach a menu to an activity, the onCreateOptionsMenu is implemented as follows. In the activity Java file, to identify each option when it is selected, the OptionsItemSelected method is used. The “item” parameter and its getItemId() method can be used together with a switch statement to identify which option was touched. This is the code above all where it should go. Thanks for reading.